Activated carbon has been used in home aquariums for decades, and it is still the largest selling filtration media product. As new types of filters and media have become available, the debate has raged over the value of using activated carbon in filters. Some believe it should be used as a standard media for continuous use in most filters. Others feel it should only be used in for special needs, and still others believe that activated carbon should no longer be used at all. It is important to remember that carbon is exhausted relatively quickly when used in an aquarium filter. For that reason, if the choice is made to use activated carbon on an ongoing basis, it should be replaced regularly. Otherwise, it is of little benefit. There are also different sources for the carbon itself, each resulting in different possible pore size. Materials such as coal, coconuts, peat, and wood are all used to create activated carbon. For aquariums, the best source is bituminous coal. Activated carbon adsorbs a number of dissolved contaminants such as chloramines and chlorine, tannins (which color the water), and phenols (which cause odors). It is important to understand that there are several important toxins that activated carbon does not remove. Most notably, it does not move ammonia, nitrite, or nitrate. Therefore, it does not aide in toxin removal during the initial aquarium setup. Water changes or other methods must be used to address elevated ammonia, nitrite, or nitrate. Heavy metals, such as iron, are also not removed. If your water source has heavy metals, use a water treatment product before putting the water into the aquarium. You may have heard that once activated carbon has reached its capacity, it will start leaching some absorbed materials back into the water. This is not an accurate claim. Although technically possible, de-absorbing requires changes in water chemistry that simply do not occur in an aquarium. However, the processes used to create some activated carbon can result in phosphate being present in the end product. In this case, it is possible for phosphate already present in the activated carbon to leach into the aquarium water. Some activated carbon products will specifically state if they are phosphate-free. If you are having difficulties with persistently elevated phosphates and can find no other cause, remove the activated carbon entirely. Perform normal tank maintenance for a couple of months and see if the phosphates remain elevated or are reduced. If they stay high, the carbon was probably not the reason for your elevated phosphate. Activated carbon will adsorb many medications used to treat fish disease. Therefore, before treating sick fish with medications, all carbon should be removed from the filter. After the course of treatment is fully completed, it is safe to add activated carbon back to the filter. The carbon will remove any residual medication in the aquarium water. 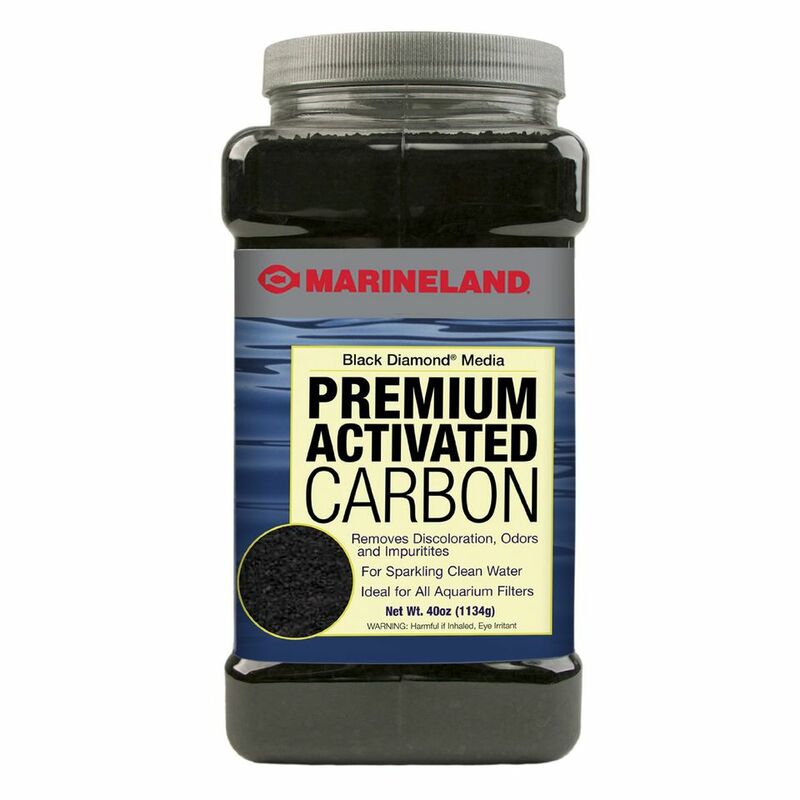 Activated carbon will lose its effectiveness rather quickly if exposed to lots of debris from the aquarium. Therefore, carbon should be placed after the mechanical filtration media in the filter. Keep in mind that if you do not keep your tank clean, and debris builds up in the filter, the activated carbon will not be effective. Since activated carbon binds with the compounds it removes, it eventually becomes saturated and can no longer remove additional contaminants. Therefore, it must be regularly replaced—once per month is usually sufficient. Longer intervals between replacement will not harm the tank, but the carbon will gradually lose its ability to remove toxins from the water. Stories about recharging activated carbon abound. Some even give step-by-step instructions, which generally involve baking the carbon in your oven. These stories are myths. The temperature and pressure required to recharge exhausted activated carbon cannot be achieved in your kitchen oven. Replacing Aquarium Filter Media: What's the Right Order?